Temperature control in 1°C increments. Fast selection of three temperature ranges. 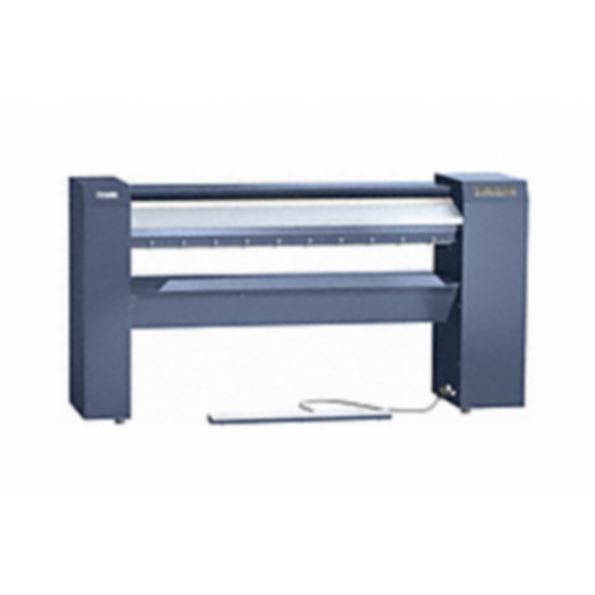 Ironer speed control in 0.1 m/min increments. Fast selection of three speed ranges. Favourite programme - allows frequently used combination of temperature and speed to be selected fast. Cleaning and waxing programme - This programme automatically sets all the relevant parameters for cleaning and waxing the trough. Infeed monitoring - Display warning issued if only one side or ironer is used over extended period of time. Pause function - Selectable via display. The trough disengages and the roller stops. After 10 minutes, the temperature is also reduced to a minimum. The ARAMID needle felt cloth is extremely temperature-resistant and highly durable. Miele-specific outfeed table with honeycomb perforation pattern - For automatic laundry cooldown. Miele FlexControl footswitch - Can be conveniently positioned in front of the machine to allow the roller to be stopped fast.